What happens to a town when its business center is wiped out? In 1906 Santa Rosa, most merchants tried to continue doing business at their old locations during the reconstruction, while the less retail/more professional trade either worked from home or operated from a business shantytown that was cobbled together a block away from the old downtown core. But first: How did James Wyatt and Mattie Oates fare during the 1906 Santa Rosa earthquake? Was their grand home damaged? Did they pitch a tent on their lawn for a few days, as did many others? Alas, we don't know anything about how they coped, but Wyatt kept his office near the center of the action. Never was the house mentioned in the ad-hoc newspaper published in the weeks after the quake, so the damage, if any, probably wasn't serious. Today, repairs or rebuilding likely would be impossible to spot; the home was scarcely a year old at the time, so any work done in 1906 would be indistinguishable from the original. And if the disaster did reveal any structural flaws, the Oates didn't blame architect Brainerd Jones, whom they soon would work with again in the design of the Saturday Afternoon Club hall. The quake hit just two days before Mattie Oates was to host her first party of the year, a Friday evening shindig for the Married Ladies Club on her first anniversary of being in the house. The party had been mentioned with anticipation weeks earlier in the society section of both papers and was, of course, postponed for several months. The Oates did host a lunch at the house for the Masonic Grand Master of California on May 18. Wyatt placed a notice in the interim Democrat-Republican to announce that he was working at home temporarily, which was unusual; he hadn't advertised in the paper before, and also because no other lawyer publicized himself at the time - yes, doctors, dentists, barbers, butchers, and other tradesmen bought classifieds in those hectic days to announce their temporary locations, but Oates was the only attorney to do so. This was likely more for reasons of ego than opportunism; the paper noted the same week that no suits had been filed since the quake. Although his house has a cozy library/study, it's more likely that Wyatt Oates commandeered the dining room during those weeks. The social convention at the time was that women held sway in the parlor(s), but men had the liberty to smoke and scatter their papers over the dining table outside of mealtimes. The side door leading to the porch also would have spared his family the fragrance of his stogies, Oates being a militant when it came to his rights to smoke anywhere in his house. Perhaps the bent-open letterbox that's still next to that porch door is an artifact from those home office days. By late May, Oates' had moved his office into the Finlaw building at the northeast corner of Fifth St. and Mendocino (current location of the El Coqui Puerto Rican restaurant) which he was to share with Dr. McLeod. Here Wyatt Oates had a front row seat to watch the political reconstruction of Santa Rosa. Immediately after the disaster, the intersection of Mendocino and 5th became the de facto emergency command center for Santa Rosa. Two views of it have already appeared in this space - most recently here, which offers a link back to an earlier photograph. 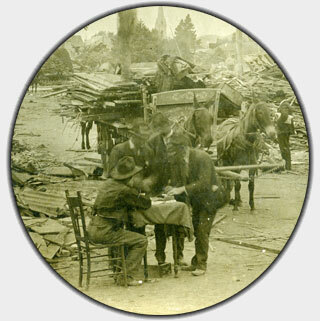 At right, men with a wagon of debris state their business at the militia checkpoint on this corner (detail from image courtesy Larry Lapeere). Dr. Finlaw's former office on the corner was apparently unharmed by earthquake or fire; in that first urgent month, it became the post office and provided the only telephone line to points north - the phone used to reach points south was nailed outside of the Chinese laundry next door. That wash house wrapped around Finlaw's small building, and Press Democrat editor Ernest L. Finley rented it quickly; for the following year and more, the laundry's storefront on Mendocino with the telephone became the temporary home of the PD, and the side facing 5th street became the Santa Rosa Republican. In the crook of the L-shaped lot was the printing plant that the Press Democrat used by night and the Republican by day. Next up on Mendocino was to be found one of the rarest sites in post-quake Santa Rosa - a large vacant lot. Amid all the rubble and wreckage, here was a spacious parcel which the Native Sons of the Golden West had cleared in preparation of building their new lodge hall. The construction of their magnificent red concrete building (which still stands today) was delayed as the property became the site of Santa Rosa's city hall and the rest of the civic center for the next sixteen months. No photos survive, but it must have been somewhat of a rat's warren of sheds and shacks (and you probably don't want to think about the lack of toilet facilities). Editor Finley, who later waxed fond over producing a daily newspaper in such hardships, offered a backwards glance as the campground closed. Writing in August 1907 he recalled, "... many small temporary structures [were] hastily erected to house public officials and accommodate private business. The Post Office, City Hall, Police station, numerous attorneys, cigar stands, the Lighting Company, photographers, architects, physicians, and The Press Democrat all found their first temporary homes on these two properties, and around them revolved for a time practically the entire business activity of the city." As the others packed their tents and left, so did Oates; he moved out of the Finlaw building as the last businesses cleared out of the Native Sons' lot next door. For the rest of his life he would work across from the new courthouse at the Union-Trust Saving Bank Building at 4th and Hinton, now known as the corner of Courthouse Square with the Wolf Coffee shop Rendez-Vous Bistro. Mrs. James Wyatt Oates will entertain the Married Ladies Card Club on Friday evening, March 20 [sic - April 20]. The elegant home of Colonel and Mrs. Oates will be thrown open to the members of the club and a few friends and they will be delightfully entertained. Colonel and Mrs. Oates enjoy a reputation second to none for hospitality, and the members of the club will spend a delightful evening with their hosts. The home of the entertainers on Healdsburg avenue is one of the most beautiful in this city, and is finely appointed for entertaining large parties. So far no suits have been commenced in the Superior Court since the quake. The justice and police courts are likewise bereft of business. James W. Oates has his law office temporarily at his residence 767 Healdsburg avenue. Will be permanently in the Dr. Finlaw corner after this week. The next few days will witness the clearing away of the last vestige of what for several months after the great disaster constituted the business center of Santa Rosa. Before the present week is ended the temporary buildings hastily erected on Mendocino avenue, just off of Fifth, will all be tenantless and those occupying the Native Sons' lot will be torn down to make room for the new Native Sons Hall, ground for which will be broken about Tuesday or Wednesday. The first business established after the shake in the vicinity mentioned was the Telephone Exchange. On the afternoon of April 18 an old-fashioned long-distance transmitter was fastened to the front wall of the Chinese wash-house which then stood on the site that has since been occupied by the Press Democrat office, and outside communication was established with points north. Miss Clara Simmons was in charge of this unique outdoor exchange, and from that little beginning there immediately began to grow up a busy business community. The Finlaw property and the Native Sons' lot were leased by various parties and many small temporary structures hastily erected to house public officials and accommodate private business. The Postoffice, City Hall, Police station, numerous attorneys, cigar stands, the Lighting Company, photographers, architects, physicians, and The Press Democrat all found their first temporary homes on these two properties, and around them revolved for a time practically the entire business activity of the city. Monday morning the Press Democrat will move into its handsome and commodious new quarters on Fifth street, just off of Mendocino, while the Santa Rosa Lighting Company will leave its present offices at the same time for those now ready in the Union Trust Savings Bank building. Contractor J. O. Kuykendall is also to move Monday into the Eardley building on Fifth street, while W. H. Summers, the cigar dealer, will move into upstairs rooms in the Taylor building on Fifth street and discontinue the retail business for a while, doing manufacturing only until he can secure satisfactory accommodations elsewhere. Summers will be the last to move, as he has to wait for the arrival of permission from the government authorities for the removal of his factory. But he expects to "pull out"not later than Tuesday. The new Native Sons' Hall, which is to grace the site of the temporary buildings now being vacated, will be a handsome and commodious structure, details of which have already been published. The contract for the steel frame and general construction has been given to the Rickon-Ehrhart company. It is also the intention of Mrs. Finlaw to construct a fine building on the corner adjoining, although no definite plans have as yet been decided upon.